It has been a while since I wrote my last post. I have been sleeping for about 3 days due to getting Altitude Sickness. I did not realize that La Quiaca is at more than 3000 meters. doh! I should have broken up my journey from Salta to La Quiaca. One day is too quick to go 3000 meters. I could have stopped at Tilcara or any of the places on the way for a night. That would have probably been the thing to do. Now for the symptoms of Altitude Sickness – a raging headache and a stomach ache. It is also incredibly difficult to exert yourself in any way and just walking around is exhausting. It is also harder to breathe because of the thinner air or oxygen content or something like that. All I have been doing is sleeping and watching TV for about 3 days. That is what you should do, just relax, drink lots of water and not eat too much. I was lucky that the hostel I am staying at, The Hostel Copacabana, has a TV in each room. I got a double room all to myself, all for ten bucks. La Quiaca is on the border with Bolivia. You just walk across this causeway and go through the border into Bolivia. It is windy and dusty here and there is not that much to do. At night, the all-night discos blast out their latino-doof until four in the morning. I am starting to get used to sleeping at night with lots of noise going on. Now for my journey from Salta. It seems like so long ago. I started off at the bus terminal in Salta and caught the 10:30am Balut. I headed north through Jujuy which is quite nice and hilly and green. Then the country gets drier and you start seeing cacti and dried-out river beds around Yala. We kept climbing up the mountains through these dusty pueblo-like towns such as Tumbara, Maimara and Tilcara. Tilcara looked like a pretty cool place and I think I might stop here on the way back to Salta in a couple of months. I arrived at La Quiaca about 6pm to complete mayhem and chaos. I walked down the road and booked into the hostel. Later that night I wandered around town looking for somewhere to eat. I finally found this restaurant and had bife de Chorizo with chips and a salad. It was awesome. I have not eaten much in the last few days but I am finally starting to feel better. Tomorrow I am off to Bolivia, but I am not sure where I am going exactly. It is either to Sucre or Oruro. I thinking of taking the train to Oruro tomorrow. It takes all night and gets into Oruro in the morning. 4 hours from Mancora. Stay at Nachos. 65 km north of Chicama. Near to El Faro. Duke Keahounha Hostel. Its a 30-40 minute walk to el faro break. Pimentel, Santa Rosa and El Faro. Puerto Eten is south of Chiclayo. It is a couple of kilometers from Trujillo. Hostels are Casa Suiza or Hostel CocosBeach. “Transportes Linea” buses run from Lima. Get a “directo”. Bravo surf camp. 45 kms south of Lima. If buying a surfboard, try http://www.wayowhilar.com.pe/home.htm or Derrem – http://www.derrem.com/english/derrem.html. Stay at Barranco in Lima here – http://www.kaminu.com/ingles/ubicacion.htm. See their representatives in Cuzco. Its about $30 per night and is in the Manu NP. Home to pink dolphins, iguanas and lots of birds. Casa de Avila in Arequipa offer spanish courses for about $80 per week. + $125 . Pucallpa is real nice to do boat trips to jungle – very cheap. Now, there is Laguna Yarinacocha (reachable by taxi from Pucallpa), and there you can rent a boat, and go wherever you want. It is usually a trip to San Francisco shipibo village, but there is not much to see. I prefered going to albergue on the opposite side of Laguna, and there they have some animals and nice short hikes into the jungle. Pucallpa itself is interesting city, it has that amazon charm. also Tingo Maria . NB. Yellow Fever vaccination required for Bolivia. It lasts 10 years. No visa required for Australians. get 30 days. Hostal Ambar Backpackers is very cheap. the flight, with Amaszonas Airlines from La Paz to Rurrenabaque, which cost some $55 USD for the 35 minutes flight, instead of the horrifying, deadly, 20+ hours bus trip. Samaipata is the southern gateway to amboro national park. Buenavista is the northern gateway to amboro np. TAMENGO Hostel-Resort Pantanal. Get here on the Death Train from Santa Cruz. There are tracks from El Calvario. No ATM in town. You can do a day trip or stay at the Apa-apa Reserve. There are two wayt to Peru. 1. Via Copacabana and the Kasani-yuyunga border crossing. 2. Via Desaguadero on southern side of Lake Titicaca. Acess it via Buenavista, 100km northwest of Santa Cruz. No ATM in town. You can access PN Madidi. I am just going to put some notes here for travel tips in Northern Argentina. I will be heading that way in about a month, so I am starting to make some plans and research some options. 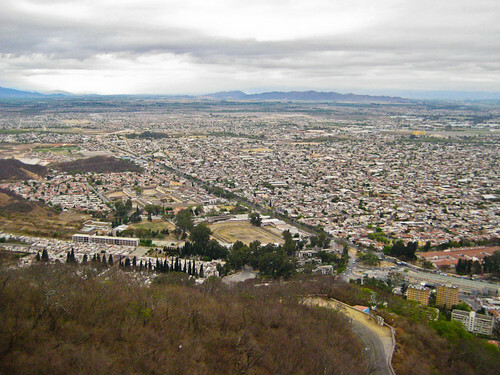 The access point is the town of Colonia Carlos Pellegrini. Don Justino Hostel ( http://www.corrientes.com.ar/donjustinohostel/index.htm ) or Rancho Inambu ( http://www.ranchoinambu.com.ar/english/ubicacion.html ), Posada de la Luna. There are no ATM’s in town. Take a boat ride. Good acess to Iguazu falls national park. Hostel Stop is at Av. Victoria Aguirre 304. There are regular buses to the park. 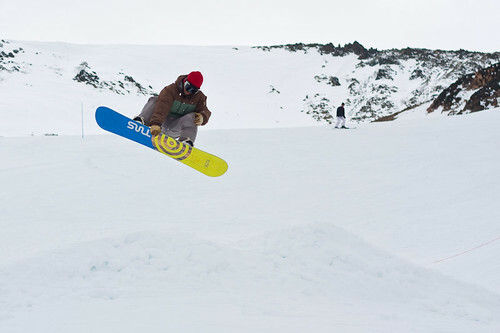 Get your ticket stamped at the park for half price on the second day. If going by plane, 4 Tourist Travel will drop you off at the door of the hostel for $ 15 ARS. PN Chaco is 115 km NW of Resistencia and 5 km from Capitan Solari. “The municipalidad (city hall) in Capitán Solari provides information on locals who rent rooms to travelers at a fair price. One such is Señora Nilda Ocampo.” (LP) There is camping at the park. Buses go from Jujuy to Libertador General San Martin. The park entrance is at Aguas Negras, 12k north of Libertador, where you can camp. Hotel Los Lapachos in Libertador is at Entre Ríos 400. La Quiaca is on the border with Bolivia which is ten blocks from the bus terminal. 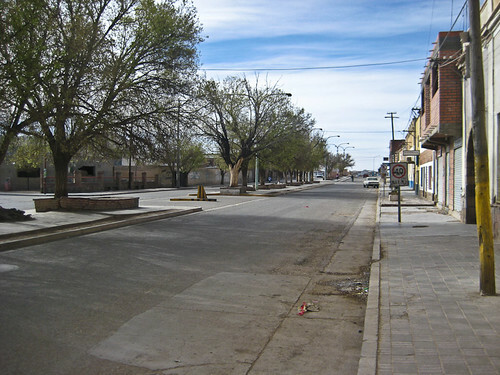 Villazon is the town on the Bolivian side but there is nothing much there. La Quiaca is 7 hours from Salta and 4 hours from Tilcara. Hotel Frontera is on the corner of Belgrano and Syria. It may be worth a trip to Monumento Natrual Laguna de los Pozuelos which is 11 kilometers from the village of Rinconada. Several buses a day run from Salta terminal. The trip takes about seven hours and cost about eighty pesos. It seems that you cannot buy Bolivianos in Salta. I tried at the money exchange but they would not sell me any. Check for yourself in any case. Hostel Copacabana is on Pellegrini and about 4 blocks from the bus terminal which is on Belgrano. I finally made it to Salta in North-west Argentina. I made a massive misculation on the buses and it was a 2 day bus ride and not one. I should have stopped in Mendoza for a night and broken the journey up into two stages. I misread the times on the schedules and thought I would be there the next morning. The first night I was freaking out because we were in Neuquen and it was like 2 in the morning and I am thinking I am going to miss my 11pm bus from Mendoza. I cannot believe the number of bus terminals I have been to in the past two days. They are just a blur. You even have to pay to go the toilets at the terminals. You give the attendant 50 centavos and they give you this great chunk of toilet paper. In one toilet they put kerosene in the piss troughs. That was a nice smell. Although it is a bit of a toss-up between the smell of stale urine and kerosene. Ha ha that digression was funny. How very rude! I ended up in Mendoza the next morning and only had a two hour wait in the terminal for the next overnight bus. I spent the time at a cafe using their Wi-Fi and trying to rearrange all my hostel bookings. The country really changed north of Mendoza around near La Rioja. It is very dry and desert-like. It reminds me of the Australian outback, similar to the Wimmera or Mallee country. There are low bushes and very stumpy trees and they stretch for miles and miles. I would hate to get lost in that country. It seems very harsh and unforgiving. We had some rain during the night Catamarca way and today it is overcast and quite muggy. I got a taxi to the Hostel La Salamanca and it only cost 5 pesos. Its only about three or four blocks from the bus terminal. As soon as I checked in I hit the sack for a snooze. A shower was even better and then I went for a walk to Centro. North-west Argentina is heaps different from Patagonia. I think I am starting to see the real South America. Patagonia and Buenos Aires are so European. Salta Centro is very busy with heaps of shops. I strayed into a market and got accosted by hawkers wanting me to buy some of their stuff. I was not used to that. I must learn how to deal with that sort of thing again. I was hearing a few birds from my window so I got out the camera and took some photos of some swallows wheeling about over-head. I do not know what sort they are yet. I have to look on the internet to get an identification. They look pretty similar to our Australian swallows, but. Blasted WiFi keeps cutting out on me. Will have to do it later. 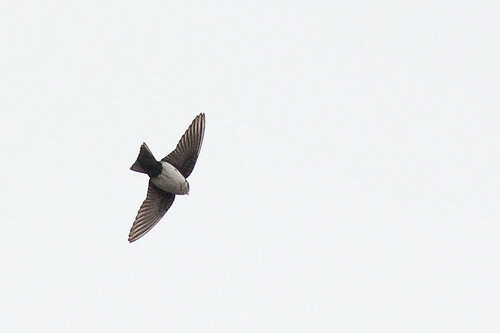 I finally got some internet connection and it seems to be a Blue-and white Swallow which has a Spanish name of Golondrina Barranquera. I went for a walk in the park and saw heaps of sparrows, and then heard a Great Kiskadee and tracked him down. I had been hearing one all the time in my room but I had failed to connect the dots. A Southern Crested Caracara flew past and landed in a tree. I think I had seen him earlier wheeling overhead. 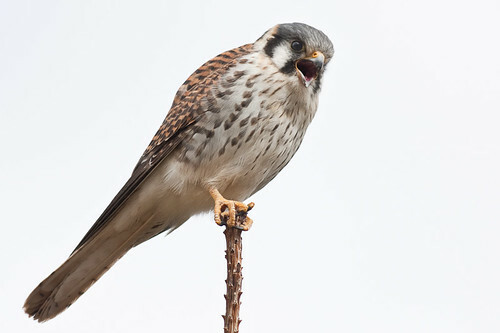 There were heaps of raptors on the road on the buses the last hop – mainly Chimangos, Andean Condors and probably American Kestrels. I even saw a caracara by the road. After a walk around the park, I went for a ride on a gondola up a mountain. I was hoping to see some birds up there, but the bush had been burnt out and was looking really sparse. Anyway, I was too tired to enjoy being a tourist and just went through the motions. There is a photo of the city I took from the gondola up the page somewhere. 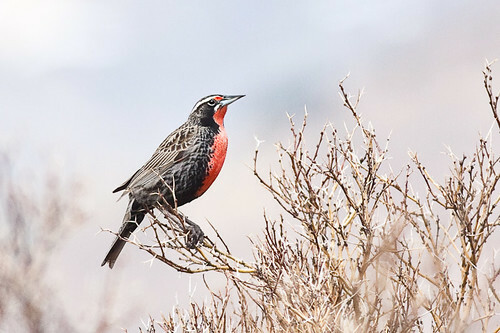 This morning I took off birding instead of skiing. I thought it might have been too icy up the mountain but it turned out all right. 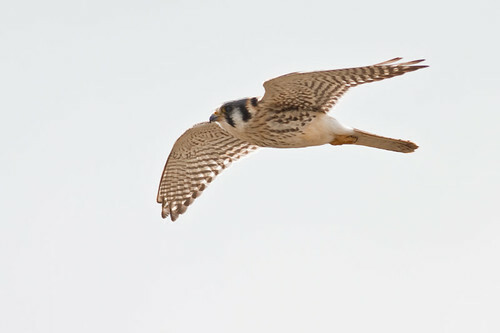 But anyway, I had a great day photographing birds and found lots of new ones. As soon as I crossed the street I spotted a Shiny Cowbird up in a tree near a house. I then walked along the train line to the Arroyo Esquel and headed up-stream. There were a couple of Teros at the start and also an Eared Dove having a feed on the grass. Further up the creek, I spotted some Teros hassling a pair of Brown-hooded Gulls and about 3 Speckled Teals. 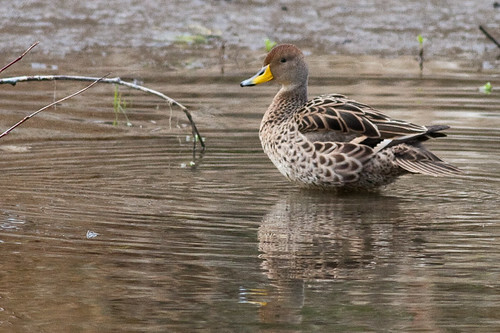 The Spanish name for the Speckled Teal is Pato Barcino. 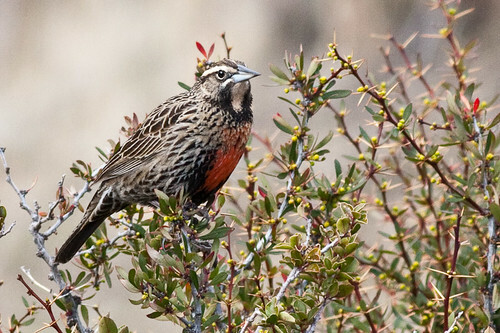 I went further up the valley and followed some birds up the hill where I spotted a few Long-tailed Meadowlarks. Their Spanish name is Loica Común. I think this one is a young bird or a female. There was a Grey-hooded Sierra-finch up the hill as well. The Spanish name for them is Comesebo Andino. 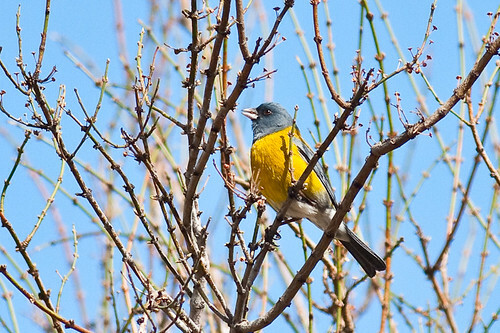 Gray-hooded Sierra-Finch (Phrygilus gayi) . 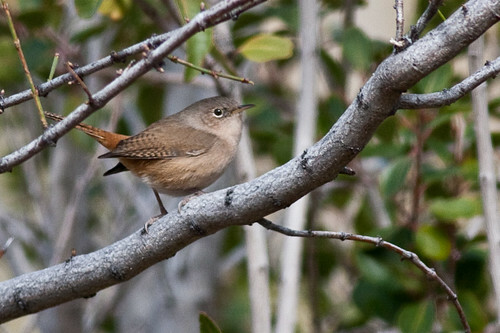 I think this bird is a House Wren, but I am not really positive about it. The Spanish name is Ratona Común. 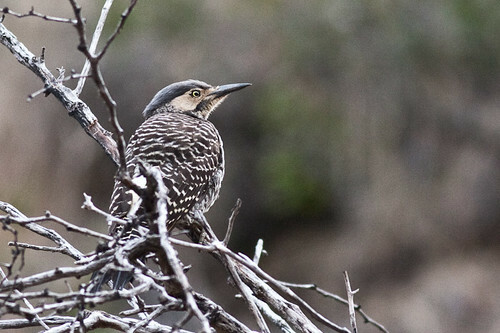 Here is a Chilean Flicker and the spanish name is Carpintero Pitio. It is funny how the woodpeckers are called Carpinteros which means carpenter. I guess it makes sense, because they are both working on the wood. There were a few Austral Thrush up the hill as well. I came down and followed the creek back to the road and then followed the train line for a while until I spotted an American Kestrel flying past. He flew past and settled on the top of a branch. 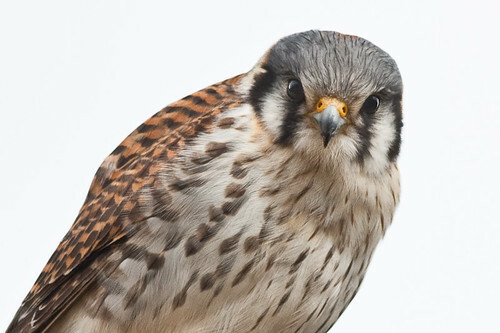 The spanish name for the American Kestrel is Halconcito Colorado. I managed to slowly walk up to him and he did not get spooked at all. 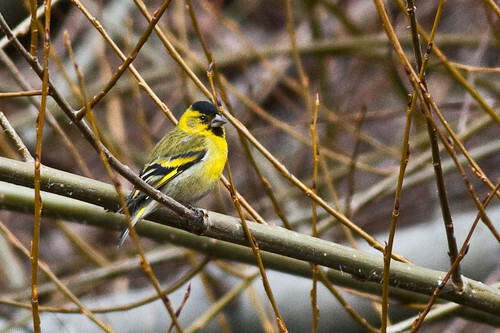 And at the end of my walk a flock of about ten Black-chinned Siskin flew out of the bushes next to the train track and settled on a bunch of bushes. The spanish name for them is Cabecitanegra Austral. 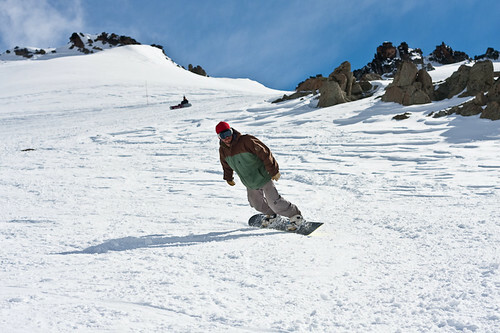 Spring Skiing at La Hoya. It is not officially spring in Argentina yet, but someone has forgotten to tell the snow about that. The snow has been very wet and sticky this week. The other day it was actually hot with the sun beating down on us. Today was overcast and a bit cooler with not much wind at all. There must have been a bit of a freeze overnight because some of the runs had chunky hard bits on them. I call them ice-blocks, others might call them biscuits or similar. I went up the mountain in the morning with Scott and Rochelle and we did a few runs down the Sol piste before heading over to the La Luna run. I went down first and set up my camera to take a few shots of Scott and Rochelle. After a couple of runs we met up with Bruno and we went for a few runs with him. After lunch, we headed off to the FlyPark, which is the park set up for jumps and rails etc at La Hoya. 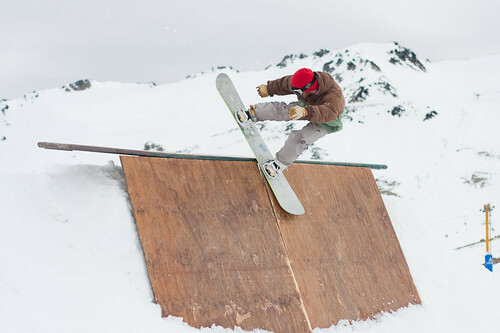 It was not the best of days for photography or for going off jumps because of the overcast sky and flat light. I took a few shots of Scott jumping over the blue wheel and the rainbow. Bruno went up these boards that were set up. I have no idea what it is called. After the blue wheel and the rainbow, Scott, Rochelle and Bruno went off a little jump. The snow is melting fast at La Hoya. I do not know how long I am going to stay here. If the sun melts it is no point hanging around. I am hoping for some more snow. Wishful thinking perhaps, but one must keep a positive attitude. This morning I got up early again and headed up the hill to La Hoya Ski Resort. 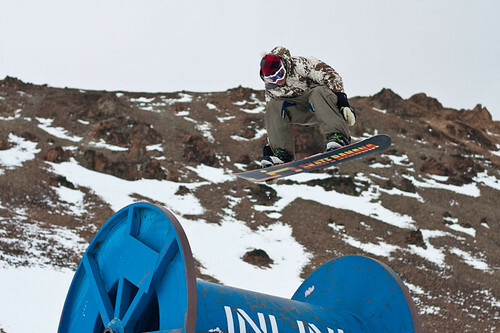 I got a lift with an Esquel local, Frederico. 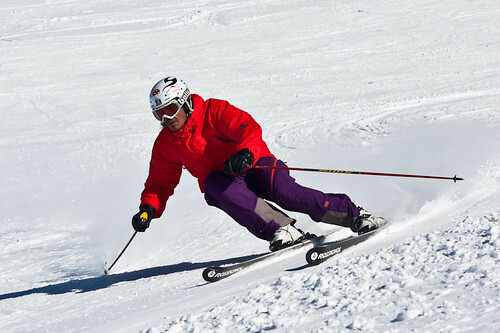 Later in the morning I took some photos of him training for his Slalom competition at Cerro Chapelco this weekend. Good luck Frederico! He had a set of small gates set up. After I took the photos, he came and had a look at them and found where he was making a mistake, so took off to try and fix it. I took it pretty easy today. 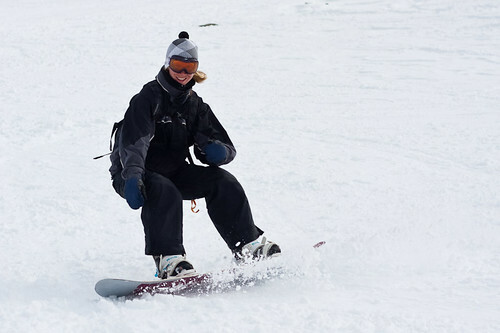 I did a few warm up runs on the pistes and then headed over to Estadio piste to try my hand at some of the fresh snow. Well, couple of days old snow, anyway. I think I am improving at skiing heavy snow. I am a bit more confident as well, which helps a lot. I stopped about 2pm and headed down the hill. I was feeling a bit tired so I thought I might give it away for the day before I hurt myself. It was the first day of spring today and I did not even realise it. But it is definitely getting a lot warmer now. I think there still might be some more snow coming before the end of the season.